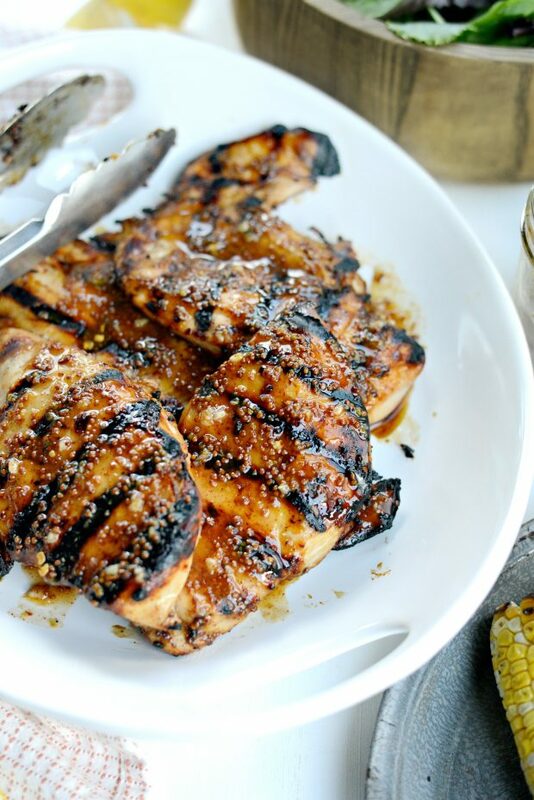 This recipe for Grilled Honey Mustard Chicken is one of my most popular recipes. A simple marinade/sauce of mustard, lemon juice, garlic and spices dresses up regular chicken breasts for a mouthwateringly delicious dinner. I have made this recipe a couple dozen times. 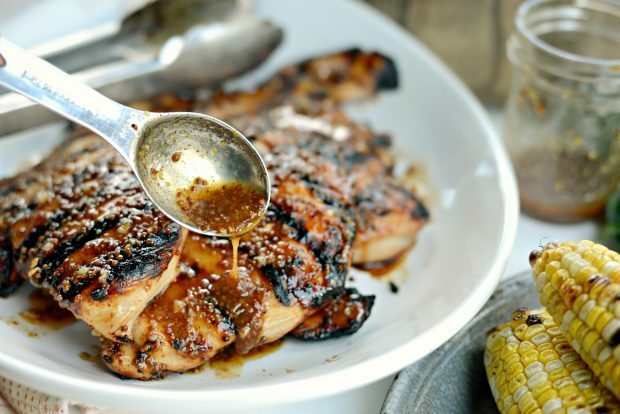 And whether it’s grilled outdoors, on a grill pan indoors or even baked in the oven, this honey mustard chicken turns out amazing every single time. With such simple ingredients, you may wonder how it could possibly be so ridiculously good? Two words: honey and mustard. Those two simple ingredients really make this recipe special. 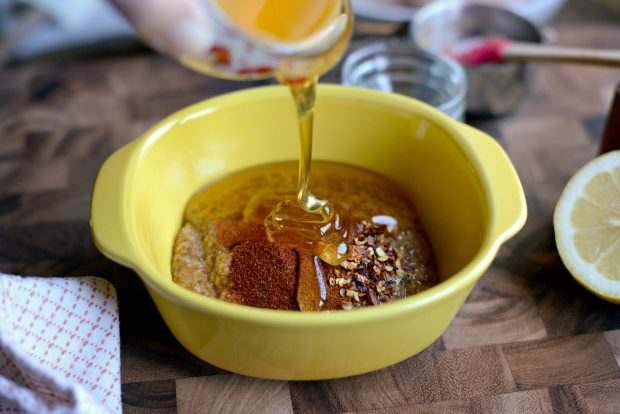 I always try to buy good quality honey and mustard, but especially when making this recipe. Have you ever had bland honey before? Because believe be I’ve picked up honey at the dollar store once out of desperation and it was almost clear in color and it hardly tasted like honey at all. 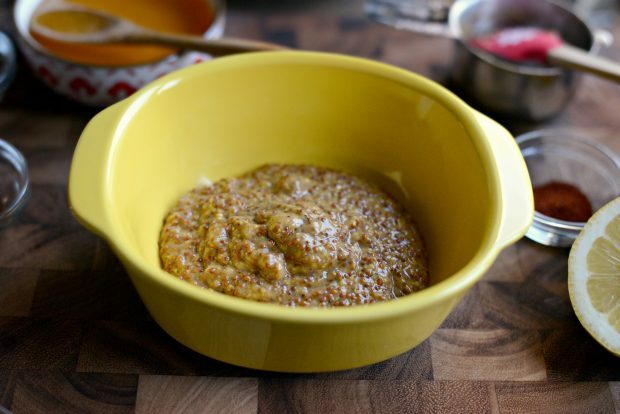 For the mustard in this recipe, try to find stone ground, whole grain natural mustard because not only is the flavor incredible, but the texture is delicious too. Then combine those with some spices and lemon juice and you have my no fail, always-a-hit-and-guaranteed-to-turn-out-delicious-every-time chicken recipe! Having company over? 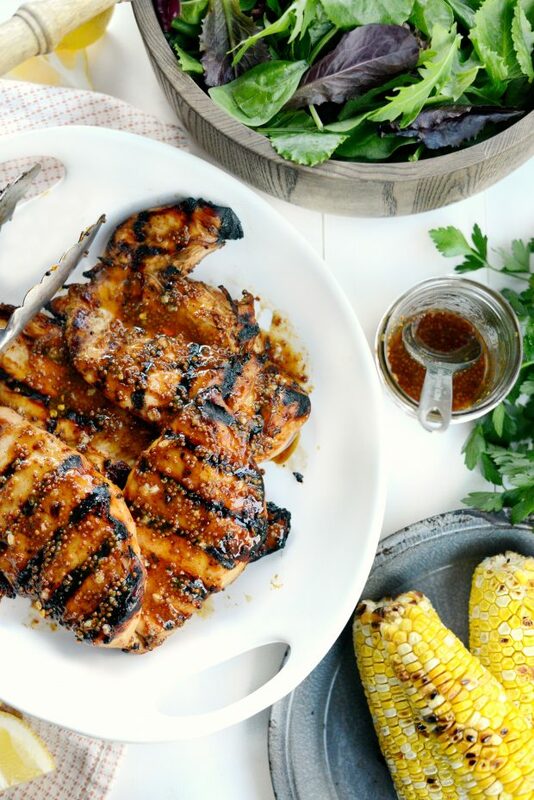 How about grilled honey mustard chicken for dinner. Want a quick dinner? 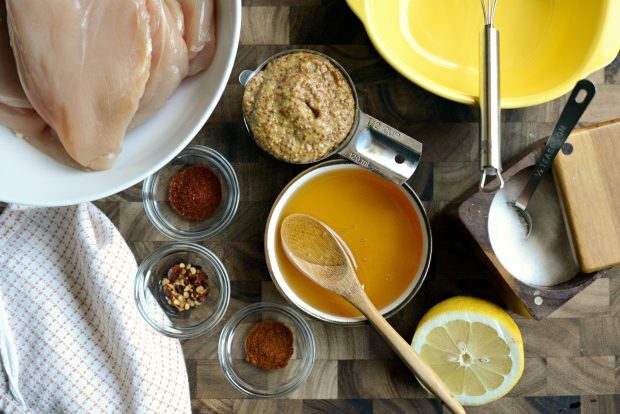 Whip up this honey mustard chicken. Not sure what to make for dinner? This is it. To start, make the marinade/sauce. 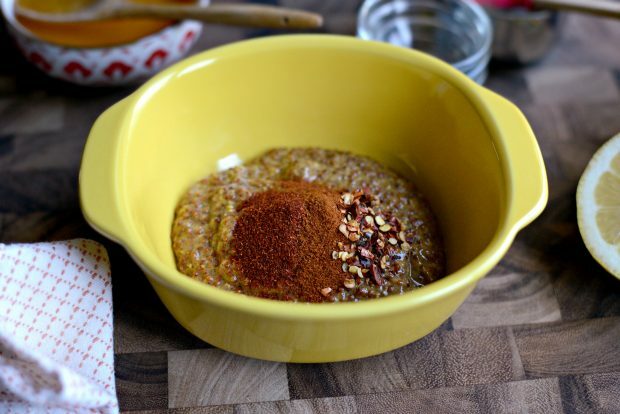 For this you will need 1/2 cup of honey, 1/2 cup of whole grain mustard (hot beer mustard, if you can find it, is really good too), 2 cloves peeled fresh garlic, juice of half a lemon, 1/2 teaspoon kosher salt, 1/2 teaspoon paprika and 1/4 teaspoon each of cayenne pepper and red chili flakes. garlic, and the juice of half a lemon. First add a half cup of the stone ground mustard to a small bowl. Then add a 1/2 teaspoon of both kosher salt and paprika and 1/4 teaspoon of both cayenne pepper and red pepper flakes. And don’t be worried about the spices, this chicken is NOT spicy. It just gives it great flavor! Next pour in a 1/2 cup of honey. Then squeeze two cloves of garlic through a garlic press or finely grate on a microplane. 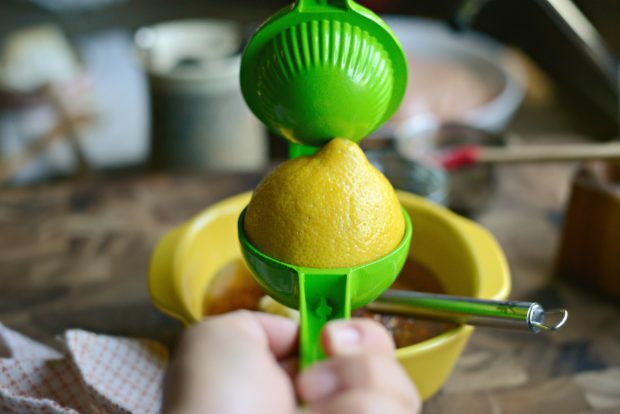 Next squeeze in the juice from half a juicy lemon. Lastly, whisk until everything is combined. Go ahead and give it a taste, you should taste the honey and mustard equally. Next measure and reserve about 1/4 cup of the honey-mustard mixture because you will want 1 tablespoon for each chicken breast. Set this off to the side until you’re ready to serve. Then pour the remaining marinade over the chicken that I pounded thin with the flat side of my meat tenderizer. This helps to ensure the chicken cooks evenly. Next, combine and cover with plastic wrap. Leave the chicken on the counter (at room temp) for about and 30 to 45 minutes. 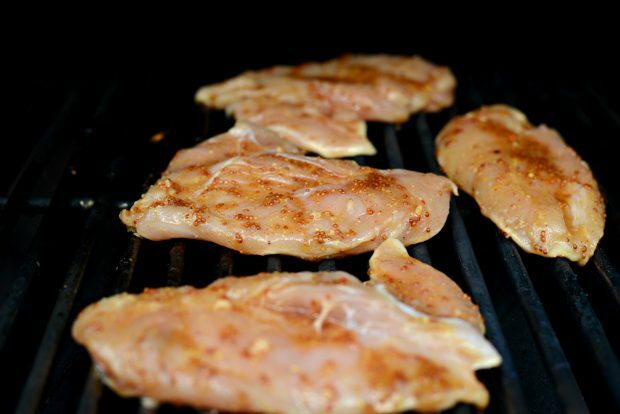 You never ever put cold chicken, or any meat for that matter, on a hot grill. Now, preheat your grill to medium to medium-high heat. 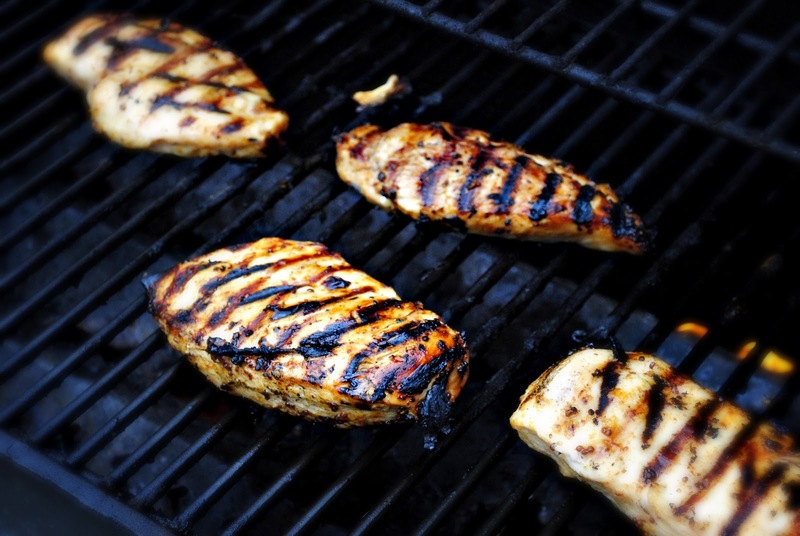 Once hot, grill the chicken for about 6 to 8 minutes per side or until fully cooked. You will know the chicken is ready to turn if it easily releases itself from the grates. Now would you check out those grill marks! Finally, allow the chicken to rest for about 5 minutes before serving. Doing so allows the juices can redistribute resulting in moist and delicious chicken. Right before serving, pour a tablespoon of the reserved sauce over the top of each piece. And there you have it, the most delicious grilled honey mustard chicken. And most importantly, with the perfect amount of sauce! Because sweet, tangy, saucy with lots of good flavor is almost too good to be true. This is my family’s favorite chicken off of the grill. 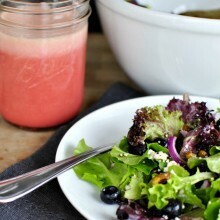 I serve this next to grilled corn and a garden salad for a quick, easy and delicious meal. Or slice and serve on top of a salad. The options are endless. For more chicken recipes check out my growing list here! Enjoy! 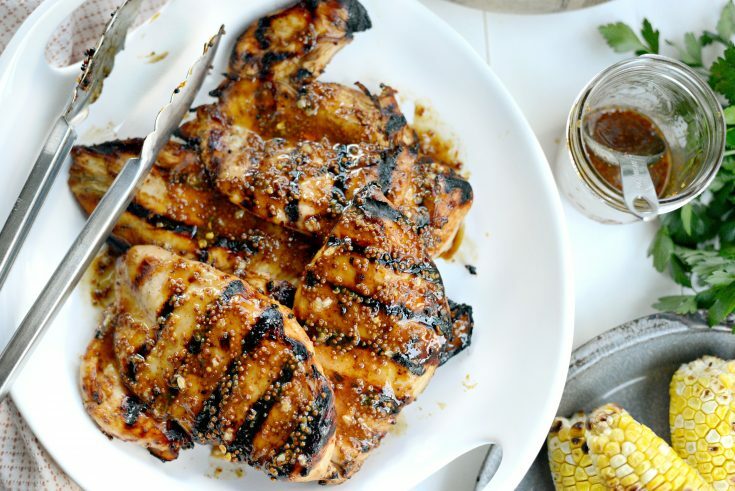 And if you give this Honey Mustard Grilled Chicken recipe a try, let me know! Snap a photo and tag me on twitter or instagram! Working with one at a time, place a chicken breast into a re-sealable bag. Don't zip it up all of the way so air will be able to escape. Use the flat side of a meat tenderizer and pound the chicken breast to about a 1/2-inch thickness. Repeat with remaining chicken breasts. 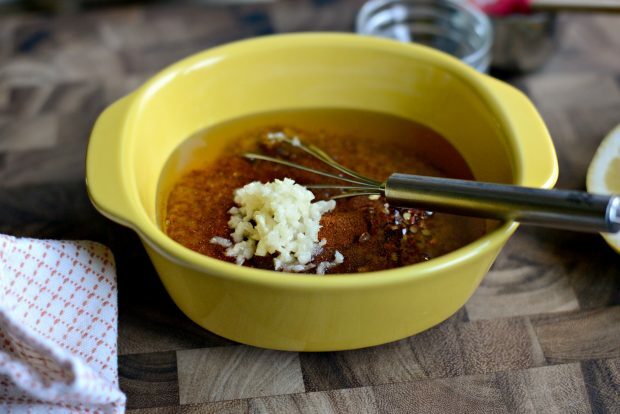 Whisk the mustard, salt, paprika, cayenne and red pepper flakes, honey, garlic and lemon juice in a small bowl. Reserve 1/4 cup of the honey mustard mixture to use later on. Place the chicken breasts into a large bowl, pour the remaining honey mustard mixture over top. Toss and cover the bowl with plastic wrap and let it sit for about 30 minutes at room temp. 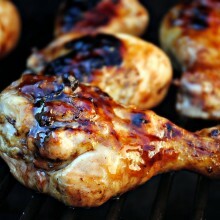 Preheat the grill on medium- medium high heat, grill chicken for about 6 to 8 minutes per side or until chicken is done. Remove the chicken to a platter to rest for 5 minutes. Pour the reserved 4 tablespoons of honey-mustard sauce over chicken before serving. TO BAKE IN THE OVEN: Preheat your oven to 350 degrees and lightly grease a baking dish. 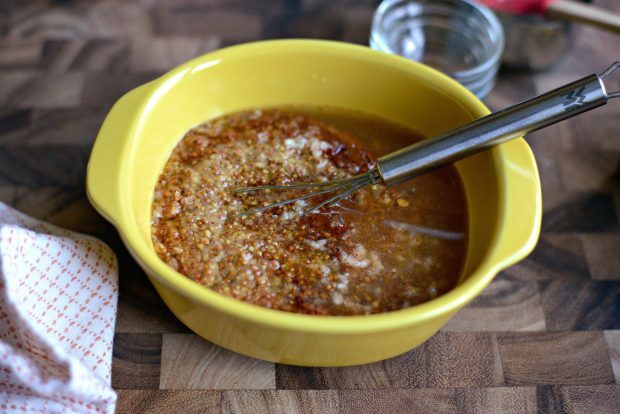 In a medium bowl whisk together the mustard, salt, paprika, cayenne, pepper flakes, honey, garlic and lemon juice. Reserve 1/4 cup of the honey mustard mixture to use later on. Toss chicken in the remaining sauce to coat and place in your prepared dish. Bake for 30 minutes, then turn chicken over and bake another 10 minutes or until cooked through. Lastly, drizzle with desired amount of the remaining sauce before serving. 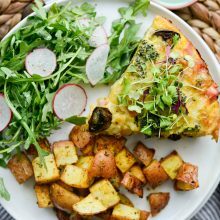 This yummy recipe deserves a comment! I will try it next time I grill. Thanks!!! Um YUM! Can't wait to try this one, I think it definitely deserves some love. I am always looking for a new chicken recipe!! Looks so good and I dont remember this on your blog. Def gonna try!!! What beautiful photos! 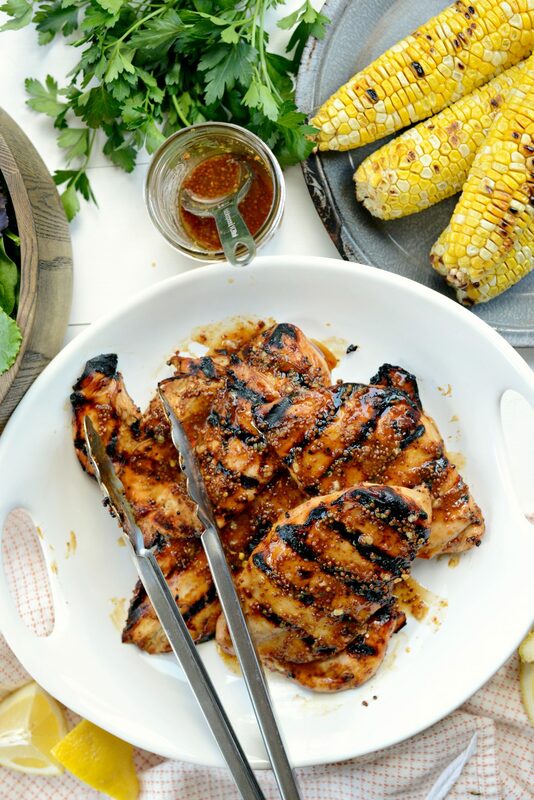 Love the sound of this grilled chicken…yum! This looks delicious, and now that I think spring has finally arrived in the northeast, it's time to start grilling! Can you share the recipe for the delicious looking side dish in your photos? I will be giving this a try very soon! Looks delicious!! 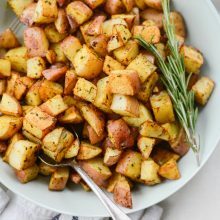 I LOVE every single ingredient in this recipe, a must try for sure! Thanks for re-posting, it certainly deserves the love! Oh my, I love all the ingredients, it has to be so delicious! Rachel, perhaps sangria? or your favorite white wine! Visiting via Parsley Sage's post. This is firmly on the bbq menu this season! I made this and wrote about it here. Thank you for sharing your recipe. With how hot it's been we've been using the grill instead of the oven. I'm so sick of our usual marinades! My daughter made this for supper tonight! Yummy! We'll be making this again! hey! if you want to use the marinade to pan fry or bake the chicken, any recommendations on cooking times? and do you think it would taste good? So I made this recipe a few weeks back for hubby. It was a hit. Today I decided to make this recipe again (however lost the link to the page). I literally have spent the past hour and a half searching online to find it again. I Made This Dish Last Night And It Was A Total Hit!! I Actually Ended Up Baking It In The Marinade At 400° Until The Internal Temp Was 165° (About 40 Minutes) And It Turned Out Wonderfully! I made this last night and it was divine! We have small children so we left out the cayenne and red pepper flakes. My daughter loved it and so did my husband and he’s pretty picky! I will definitely be making this again! That’s great Jodi! I’m so glad 🙂 thanks for coming back to leave a comment I appreciate it! This is an amazing recipe. We made this today for our Thanksgiving lunch with quinoa and a fresh green salad. Was amazing. I made is as is, no alterations and none needed. This is a keeper for sure. Thank you for your recipe. This is fabulous!!! I added a bit of onion powder and some hickory liquid smoke. SO good. I will be using this to make Yardbird sandwiches next. Just wondered if anyone was realizing that the reserved marinade has had the raw chicken in it and should be cooked before putting it on the grilled chicken. Just cooked this on the grill & OMG it is sooooo good! I used Honey Mustard from French & we loved it! Will be cooking this again very soon. This sauce was DELICIOUS! I used the same brand of mustard as shown in the ingredient photo, only what I had on hand was the “Sweet Hot Pepper Mustard” made with Habañero, jalapeño, cayenne & chipotle peppers. I did not add the chili flakes or cayenne pepper as the recipe calls for. The sauce still had a great kick to it. The recipe reminds you to reserve 1 tablespoon of sauce per chicken breast. I one-and-a-half timed the quantities, just to have more for serving. It’s that good. Good enough for company! Can this be used as a freezer meal? If you’re baking the chicken in the oven, what temperature and for how long? Looks delicious! Do you know how many calories are in this? I made this chicken on Saturday night when we had some friends over to grill out. It was so delicious that I’m making it again tonight! Thank you thank you for this delicious recipe! I made this and it is delicious! I heated up the leftovers at work and had half a dozen people ask me what I was eating and to forward them the recipe. I tried this tonight and it was so amazing! And easy! Doesn’t get much better than that. Thanks for the great recipe! made this tonight, very good!! It even looked like yours haha! And if anybody needs to know its 8 WW points for one whole chicken breast!!! I never write comments about recipes, but, had to with this one. 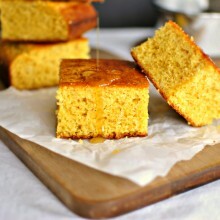 I found this recipe a couple of weeks ago and my husband is already requesting it again. It was deliciously easy and great leftover the next day. Love the fact that the marinade has no oil in it. Makes it a healthier yummy way to eat chicken. Can’t wait to try it out on company. Thank you!! I use less honey but this is my favorite chicken recipe ever! It’s a staple in our home now. I just love it! Thank you so much!! this chicken was awesomme. So moist! I used chicken breasts and drummettes too. Will definitely keep this recipe in mind when barbecuing. I just made this on the grill tonight and I used boneless chicken thighs instead of chicken breasts. It came out so good and I can’t wait to make it again! It’s definitely a recipe I will be going back to for sure. Made this tonight it was amazing!!!!! And so easy to make. Even the picky kids ate it. 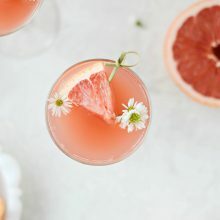 I have made this before and loved it, so I was looking for this recipe again when I came across this website using your pictures and recipe with no credit to you. 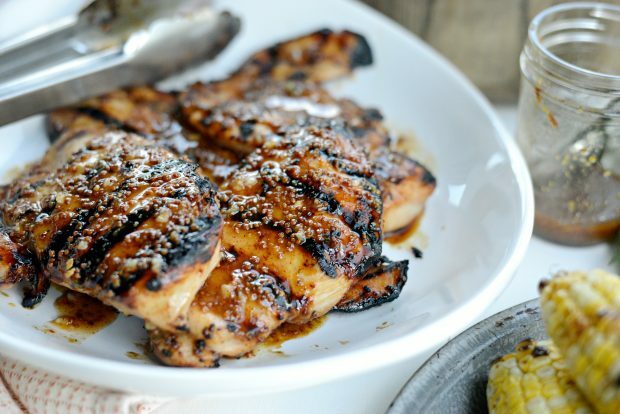 (http://www.muchtaste.com/2015/01/grilled-honey-mustard-chicken.html) I don’t know if you can do anything about this, but I just thought you would like to know! Thanks for the heads-up Holly! Perfect weather today in The Netherlands for a BBQ. So tried your chicken recipe. Delicious and very tender. Thnx for sharing! This marinade is the best!! Thanks for posting it, I’m on here to check out some of your other recipes!! Thank you so much for this recipe. I made it last night and my husband loved it. I heated the reserved sauce and poured it over the chicken before serving. I will be making this again soon! Hi Laurie, was just wondering if the chicken could be marinated the night before? I was wondering the same thing! Can I marinate over night or just for under an hour? Just made this and it was AMAZING!! I like it so much I think I will try it on some salmon tomorrow 🙂 You are right, the whole ground mustard is what sets this apart. Thank you for sharing. I’m trying this for the first time today. Just tasted the marinade and it is delicious. I had to substitute garlic paste. It’s delicious. I wish I could find that mustard though! I did luckily have whole grain. Hope the family likes it! It looks great in the pictures! I made this last night; it is very, very good. Simple ingredients indeed, and it doesn’t need to marinade all day. A keeper for me. I made this last night and my family and guests devoured it! So good! Any idea of the nutrition facts??? Made this tonight, was sooooo delicious. This will be my go to chicken dinner. Yay! So happy to hear that Irene! This looks AMAZING! I have chicken breasts I need to use today, and really want to try this out, only problem is I only have spicy brown mustard. Do you think this will work ok? 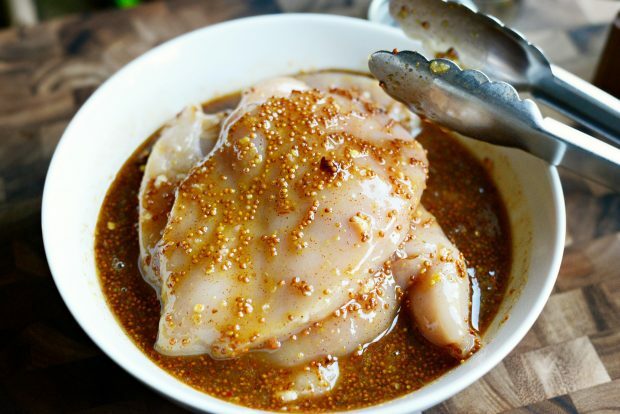 This is a great go to recipe when you don’t have a lot of time for marinating. 30 minutes, that’s it! The taste is fantastic…. try it you’ll like it! I made this for supper tonight and what a hit! This will definitely go into the regular rotation! I made this dish last night for the family and my 6-year old daughter looks at me and asks, “Mom, is there a word for a food that’s better than the best food in the world?” I didn’t know what to say and I must have paused too long because she chimed in “It must be the best food in the universe”. Needless to say, the chicken was a hit! We loved it! What would be the baking instructions if not grilling? Hi Nikki, I would bake it on a rimmed, metal sheet pan at 350 degrees for about 20-25 minutes (it really depends on the thickness and size of the chicken breasts). Then I would move the rack in your oven close to the top, flip on the broiler for a few (watch carefully) to caramelize the tops of the chicken. Enjoy! I was looking for a marinade for pork tenderloin and came across this recipe for chicken. As I read the ingredients I figured it would suit pork as well. So I tried it. I used everything it said and grilled it. Fabulous! So, also versatile. 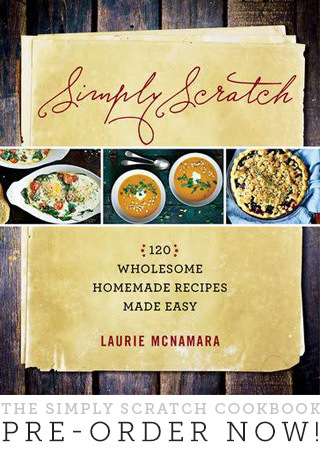 I will hold onto this simple and delicious recipe. Would love to try this tonight. No problem! Here’s how I do it: Preheat your oven to 350 degrees and lightly grease a baking dish. Looks delicious! Could we marinate overnight? Hi Julie! I personally wouldn’t marinate overnight. After a couple of hours the acid in lemon juice can break down the chicken, ruining the texture of the cooked meat. Why do I have to cover it with plastic while it’s marinating? We had this last night It’s DELICIOUS! Definitely a good candidate for company. This looks amazing! 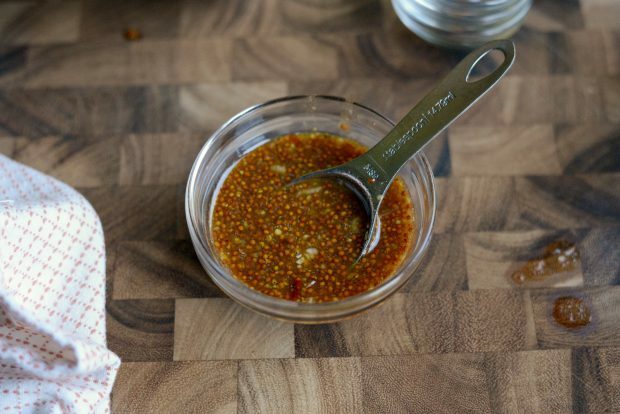 Is it possible to use this marinade on bone-in wings? Can’t wait to try it! I don’t see why not! Let me know how it goes for you, Makenzie!